Libya (/ˈlɪbiə/ ( listen); Arabic: ليبيا‎, translit. 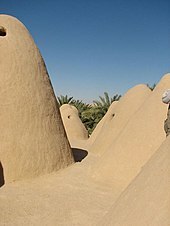 Lībiyā), officially the State of Libya,[dubious – discuss] is a country in the Maghreb region in North Africa, bordered by the Merranean Sea to the north, Egypt to the east, Sudan to the southeast, Chad to the south, Niger to the southwest, Algeria to the west, and Tunisia to the northwest. The sovereign state is made of three historical regions: Tripolitania, Fezzan and Cyrenaica. With an area of almost 1.8 million square kilometres (700,000 sq mi), Libya is the fourth largest country in Africa, and is the 16th largest country in the world. 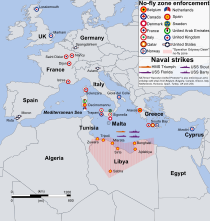 Libya has the 10th-largest proven oil reserves of any country in the world. 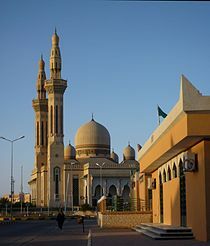 The largest city and capital, Tripoli, is located in western Libya and contains over one million of Libya's six million people. 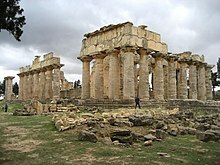 The second-largest city is Benghazi, which is located in eastern Libya. 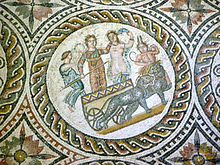 The Latin name Libya (from Greek Λιβύη, Libyē) referred to the region west of the Nile generally corresponding to its central location in North Africa historically visited by many Merranean cultures which referred to its original inhabitants as the "Libúē." The name Libya was introduced in 1934 for Italian Libya, reviving the historical name for Northwest Africa, from the ancient Greek Λιβύη (Libúē). 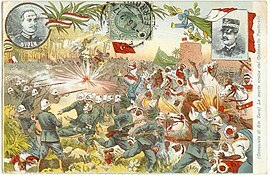 It was intended to supplant terms applied to Ottoman Tripolitania, the coastal region of what is today Libya having been ruled by the Ottoman Empire from 1551 to 1911, as the Eyalet of Tripolitania. 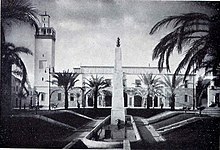 The name "Libya" was brought back into use in 1903 by Italian geographer Federico Minutilli. 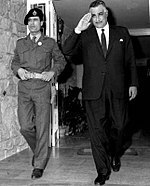 On 24 December 1951, Libya declared its independence as the United Kingdom of Libya, a constitutional and herary monarchy under King Idris, Libya's only monarch. The discovery of significant oil reserves in 1959 and the subsequent income from petroleum sales enabled one of the world's poorest nations to establish an extremely wealthy state. 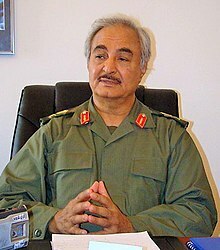 Although oil drastically improved the Libyan government's finances, resentment among some factions began to build over the increased concentration of the nation's wealth in the hands of King Idris. 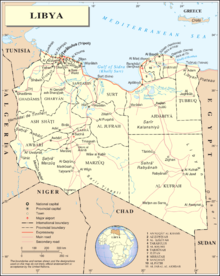 Libya extends over 1,759,540 square kilometres (679,362 sq mi), making it the 16th largest nation in the world by size. 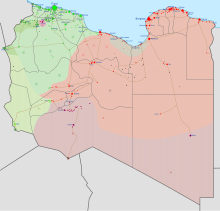 Libya is bound to the north by the Merranean Sea, the west by Tunisia and Algeria, the southwest by Niger, the south by Chad, the southeast by Sudan, and the east by Egypt. 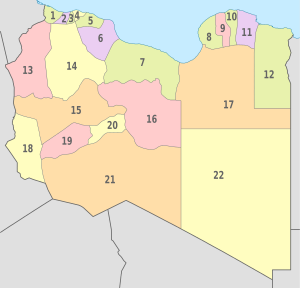 Libya lies between latitudes 19° and 34°N, and longitudes 9° and 26°E. At 1,770 kilometres (1,100 mi), Libya's coastline is the longest of any African country bordering the Merranean. The portion of the Merranean Sea north of Libya is often called the Libyan Sea. 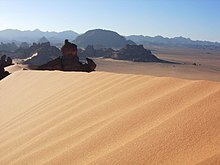 The climate is mostly extremely dry and desertlike in nature. However, the northern regions enjoy a milder Merranean climate. Since 1975 the number of universities has grown from two to nine and after their introduction in 1980, the number of higher technical and vocational institutes currently stands at 84 (with 12 public universities).[? clarification needed] Since 2007 some new private universities such as the Libyan International Medical University have been established. 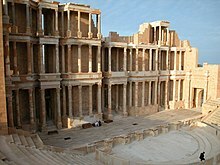 Although before 2011 a small number of private institutions were given accration, the majority of Libya's higher education has always been financed by the public budget. In 1998 the budget allocation for education represented 38.2% of Libya's total national budget. ^ a b c András Zboray. "Flora and Fauna of the Libyan Desert". Fliegel Jezerniczky Expions. Archived from the original on 8 December 2012. Retrieved 5 February 2013.